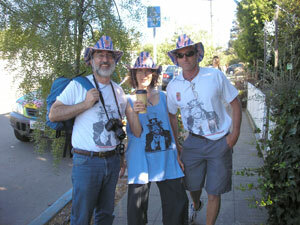 Yesterday, as a part of our presidential campaign’s enough tour, we were in the how Berkeley Can you Be parade. It turned out to be one of the most effective pieces I have ever done. It was sheer fun! Below are the write-ups of it by Erika, and Corey and Alexi [A.K.A., Da Boyz] to flesh out the details. But it was amazing to see Dr. Richard Kerbavaz…now just “Rich”…my ear doctor of 20+ years outside helping Erika decorate our cars before we headed off to the parade…amazing that Carl L. who is building next door to us [he owns about half of our neighborhood and we had fiery battles with him for years], stopped working so that he could drive one of cars in the parade [Rich drove the other]…amazing that Carl Bryant, a labor activist, manned our booth in the park for hours until the parade had reached the park. What is amazing is the quality and the range of people that this campaign is bringing together! Camping out in our beautiful booth…designed by Erika and set up by Da Boyz…was only slightly less intense. People got the tribal body that the 6 of us [Linda, Mikee, Erika, Da Boyz, and me] are together! It was parade day!!! I had oatmeal and juice, got into my parade outfit and got all ready to go. Then I filled all the balloons up and came down to start on the car. 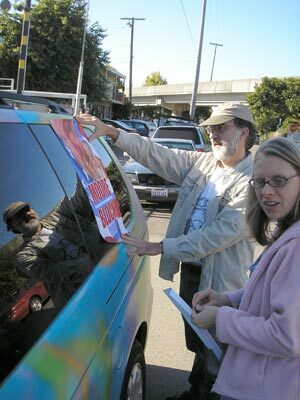 Dr. Kerbavaz arrived and he helped to decorate with all the Frank Moore Suzy Block posters in the windows and the peace flags which we had gotten copied on vinyl and attached with supper strong magnets. We loaded up the little car with the balloons and picked up Carl L and off we drove to the parade. Carl L. was asking me lots of questions on the way, like how everyone liked the car now that it's painted, how the residents are, about Hugo's and where I grew up. 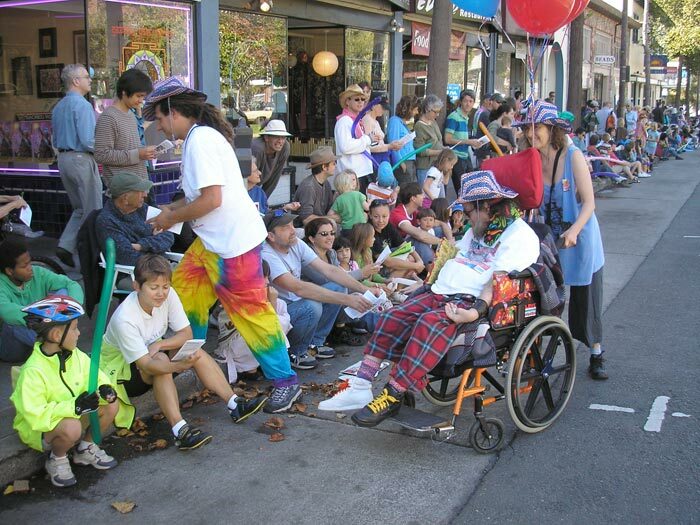 We unloaded at the mouth of the parade and we got Frank out of the car and attached red white and blue balloons to his wheel chair and to the racks on top of the cars and off we went. 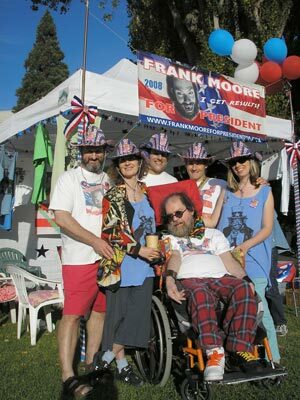 We were all dressed in our Frank Moore for president or our Uncle Frankie t-shirts, with our red white and blue matching cowboy hats with Moore/Block buttons on them. Kerbavaz drove the lead car with the boom box on top playing our "Frank Moore for President, he gets result” chant/mantra then "Frank Moore for President, He delivers," “Moore/Block for president in 08” which the six of us had recorded earlier in the week and Mikee added the music of our Saturday night jam from the LA trip. We were quite a sight!! We walked in the center of the two cars Frank pressing the flesh with the people who were watching the parade and the rest of us passing out Frank Moore for president platform brochures, and people loved it, most people took the brochure, many eagerly wanted it, some said they watch our shows on TV and one guy said that he learns from watching the shows. The kids loved Frank and were happy to get some presidential stickers! Some cheered, some said that they were fans of Dr. Suzy Block’s show! It was amazing! And we gave out over 1,000 platform brochures by the end of the parade and Corey had to run a few blocks to our booth to replenish our supply during the parade. I gave out buttons to those people who were really excited and seemed like they would wear them, some people asked for them or for their friends who were fans. We were blown out by how many brochures we gave away and how excited everyone was. After the parade we set up camp in our booth which Corey and Alexi had set up earlier with a little tent and all kinds of red white and blue decorations, stars and bows, red table cloth with a glass American flag vase we found at the yard sale with red white and blue flowers in it of course. 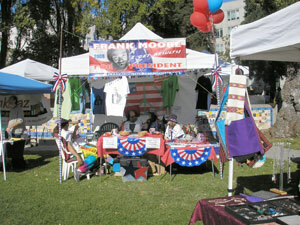 The Frank Moore for President banner was at the top in the front. We had all of our stuff for sale there, t-shirts, buttons, bumper stickers, magnets, platforms to give away and we had a portable dvd player playing the platforms like we have on Youtube. It was a beautiful booth and we had chairs for all of us with pillows on them. 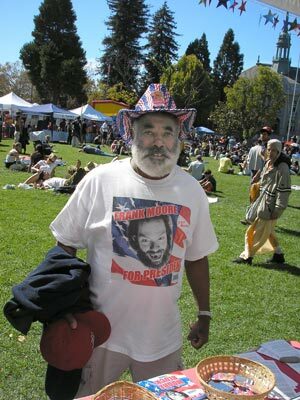 Carl Bryant had been manning the booth until we got there in his Frank Moore for President t-shirt with a red white and blue cowboy hat. We got all set up all comfy in the booth and then Mikee and I went to Razan's with everyone's lunch order, various yummy burritos and a salmon sandwich. It was all really yummy and we were quite hungry by this point and it felt good to sit down. We spent the afternoon in the booth talking with people as they came to the booth and giving platforms away. Many people took photos of the cars, the booth and of us all day long. A lot of people would just stand and look at the booth and us for long periods of time just looking, taking it all in. We got coffee at Peet's which turned out to be not as strong as we like it. A final trip to the bathroom lead to a tour to see all the art cars which were really fun, including a guy who had glued pens all over his car, wow! Then there was a guy who had plastic lobsters and fish all over his car. He would play music and then would animate the creatures to sing and dance. It was really fun. Then we went around and checked out the booths and ended up doing a bit of shopping finding some really great stuff!! Then it was time for some final photos and to pack it all up and head home. At home we started to move a little slower, unpacking, talking about the day. We were up at 6, writing the day, having breakfast, and ready to start loading up just before 7:30. It looked like it wasn't going to work ... to load all of that stuff into a CRV! But we did it! While Corey loaded, Alexi fixed Cookie up with snacks for the day. Erika was up having breakfast, and before you knew it, we were outta here. We got to Civic Center Park exactly on time, found one of the coordinators of the event, and found our spot, and hustled to get set up! Right next to us was Dolkar's family, her mom, dad and niece Tenzin setting up their stand. It seemed as thought we had an unbelievable amount of stuff to do to get set up, and not much time, and this was true! But time slowed for us. Soon Carl was there, with his big smiling face, saying, "You guys are supposed to have all of this up already! You're not done!!??" He went to work right away helping decorate, and we were changed and heading down to California St. just before 10:30! What a fun, amazing, mind-blowing experience the parade was! It was like the experience we all have had giving people Frank's platforms magnified, sped up 1000x ... amazing to see/hear the positive reactions from everyone who got a platform, and saw Frank wheeling by ... There was a level at which just seeing the cars with the Frank Moore for Prez banners on them, seeing Frank wheeling by in his wheelchair, and simply being handed a platform that we could see just blew the lid off of things for a lot of people, so many people just broke into a smile at the combination of those things, as if to say, "This guy is running for President! That is great!" A flood of hope and inspiration and fun ... it just made people happy. And that was even without the level of actually reading the platforms! Which so many people were doing, and finding things right away that they loved. One time, Alexi went back to the CRV to get more platforms, and Carl said, "Where are all the black people?? That's how Berkeley has changed in 40 years ... there don't seem to be any more black people." Corey went back for more one time, and saw Carl in his slumped back groove ... "Hangin' out!" Carl: "Yep, I'm getting my lean on ..."
The reality altering fun just continued at the park where we joined Carl B. at the booth, and got to hear about his run in with two IRS agents who insisted that Frank's tax plan wouldn't work! Fun to just hang out and hear Carl and Frank talk, and to watch people come up to the table and read the platform, check Frank out, putting everything together, and really liking it. Amazing that after checking out the platform, the mother and daughter wearing Obama t-shirts would tell Frank that he has their vote and that Obama is their 2nd choice! Fun to see Carl L. dancing around and having such a good time, and Dr. Kerbavaz too having really enjoyed it all. The food was really really good, and we wondered why we never went to Razan's when we were out and about? It was because we had an impression that it was super expensive, a prejudice based on a time a long ways back when we got a couple of burritos and it ended up being $20! But really their prices were competitive with any around here now, and the food was so good and felt much healthier than anything else around. Despite the weak coffee! everything was so much fun, and really neat to see Frank interact with people at the booth ...and the reactions of people to the campaign ... Amazing to think of so many people looking at Frank running for President through the same lens as they view all the other media around the "front-runners", and how Frank really stands up! Then it was breaking down and loading up the car again ... amazing to see that bright happy hopeful booth wrapped up and tucked away and nothing left ... but its imprint!